An Unsecured Business Loan allows you to cover any business related finance need. The Unsecured Business Loan is a short term facility – usually up to a maximum of 12 months. You’ll repay the loan and interest daily or weekly. No security (collateral) is required to get a loan. What can you use an Unsecured Business Loan for? Unsecured Business Loans can provide a boost to your working capital and allow you to make investments in inventory, equipment, renovate, hire new staff – ANY business activity. Some business owners use this type of business loan to cover cash flow fluctuations and even for new business opportunities. An agreed amount is made available for you to access at any time you need it. Often with a line of credit you will only pay interest on the drawn down amount, not the whole facility. What can you use a Business Line of Credit for? There are no restrictions on how you can use this money. Invoice finance is also known as “factoring” is when you sell your invoices to a lender. The lender will forward you up to 80% immediately of the invoiced amount and become responsible for collecting payment. Any business purpose like buying new machinery or paying tax debt. With Merchant Cash Advance a lender will provide you with a lump sum payment in advance and then collect repayment (and their fees) as an agreed percentage from your daily sales. What can you use a Merchant Cash Advance for? Anything, such as working capital or buying new inventory. Equipment finance is a fixed term loan product to purchase machinery or equipment for your business. The asset will be owned by the Lender throughout the term of the contract. What can you use Equipment Finance for? To purchase plant, equipment or machinery for your business. A medium term loan product to purchase an asset. The asset is owned by the Lender until the end of the finance term. What can you use a Hire Purchase for? Typically used to purchase an asset. Buying plant, machinery and equipment for your business. This business finance can be provided over a range of terms, usually to help with seasonal shortfalls in working capital. What can you use a Commercial Bill of Exchange for? A longer fixed-term secured borrowing facility, like a mortgage. Often you will need to use personal assets to secure the loan. Most commonly available from the big banks (think: ANZ, Westpac, Commonwealth, NAB). Usually used to purchase buildings, retail premises, expansions, buying competitors. Your typical personal finance fixed term loan, fixed or variable interest rate loan. You can use this money to purchase anything. As per your standard credit card, a company credit card will often been securitised against the business owners. Best used to purchase consumables and to help smooth out fluctuations in cash flow. In reality, you can use it for whatever you like. The three basic principles to consider when evaluating finance. You can cover fluctuations in working capital with flexible short term business loans or an overdraft – but if you’re making a big purchase you’ll need a long term loan with a repayment schedule that matches your cash flow. Maintaining cash flow is one of the biggest challenges faced by any small business, so it’s vital that you have funds available when you need them – but be aware that you’ll pay more for at-call financing like an overdraft, which gives you access to funds whenever you need them. To successfully secure financing you’ll need to convince a lender that you are a good risk (as per how they determine this) to get the lowest interest rates. For some types of loan, you’ll need to offer security, such as your property. With any financing application you’ll have to provide full financial data about your business – and a realistic repayment schedule that takes into account factors such as seasonal fluctuations in turnover, and the risk of late payment by your customers. Online lending is becoming a crowded market and there are new lenders popping up all the time, many specialising in particular forms of business lending like invoice finance. Each have different requirements (e.g. minimum borrowing amounts) and offer different terms and conditions. To get a business loan you’ll need to prepare a basic business case and budget for your loan. Establish how much you need to borrow and how much you can afford to repay, over what period. Do not over commit your business. Use this business loan calculator to determine how much you can borrow. From here, the Lender will assess your loan amount versus the creditworthiness of your business to determine your eligibility and either provide you with an instant response online or phone you, once their credit team has looked at your application. Once approved, you can sign the loan agreement (electronically) and get the business loan funds on the same day. If you are a start-up, you’ll find out that no one really wants to lend to you, you’re just too high risk. You could consider doing sweat equity deals (people provide services to you at reduced or no cost in exchange for equity) or sell some equity. Alternatively you can search for a suitable business grant or beg family and friends. Around 25% of ALL small businesses have a credit card but no other forms of debt. Be aware a business credit card will often be secured against you personally but can provide the instant cash injection you need to pay for supplies and inventory. Use wisely and carefully. Q: What's the difference between a bank business loan and a loan from a fintech lender? To a bank, whether you are borrowing $30,000 to do a renovation or wanting to borrow $2,000,000 to acquire a competitor makes no difference to them. For this reason, banks aren’t always overly excited to facilitate this loan for you. Where as a fintech lender is geared up for exactly this, small business loans. Most fintech lenders allow technology to decipher your business’s financial health and make a lending decision fast. If you do manage to jump through all the hoops the banks put you through, you will most likely be offered a much lower interest rate than a fintech lender with less fees. However, if you are like the overwhelming majority and need fast access to cash, the fees and higher interest rates can seem insignificant. Q: What interest rate can I expect to pay? With an unsecured business loan you will pay higher interest rates than that from a bank. Again, it’s a risk rated product meaning that a business that hasn’t been trading long, with inconsistent revenue - will pay more than a business loan applicant who has been operating for 5+ years with consistent revenue. Q: Are there different requirements if I live in a particular state? No, regardless of whether you live in WA, SA, NSW, VIC, TAS, QLD or even NT, you will be assessed the same way, but do note if you live in a tourist “hot spot” your business may have seasonal income which will be assessed differently. Q: Can I pay off my business loan early? Yes, most lenders will allow you to pay out your loan early, HOWEVER, you need to check the fine print. Some lenders will charge you for the privilege and sometimes this will outweigh paying the loan out early. If you feel you might be in a position to pay the loan out early, or at least want the flexibility to do so without penalty, you need to choose a lender with this as an option. Q: Why do I need to provide bank statements? You’re asking to borrow tens of thousands of dollars to your business. A lender needs to feel comfortable to lend their money to you. To get that level of comfort, the lender needs access to your bank statements as this gives a true picture of your business. It essentially allows the lender to reverse engineer your real, “right now” Profit and Loss (P&L) statement. Balance sheets, P&L Statements out of your accounting systems can all be altered and may not be up-to-date. Bank statements do not lie. Read more here. Q: How do I get a business loan to buy an existing business? Buying an existing business can be an exciting opportunity to grow your business and open doors to new customers. If you’ve done your due diligence, have a solid strategy and you’re confident that the acquisition will be beneficial for your business then you can apply for a business loan. Make sure you have factored in all the costs and have estimated your new revenue. Lenders will still take into account how long you’ve been business, your current revenue and expenses and the industry. Q: Is my business eligible to get business finance? How long you have been trading. Most lenders like to see that you have been trading at least 12 months. Your industry: Lenders will lend to most industries, but some are more favourable than others. Your financials: As mentioned, lenders will want to see your bank statements to make a decision. They want to assure that you can afford to service a loan. Your credit score: Does your credit history and score reflect that you’re responsible? Its best to speak with a business loans broker if you have more eligibility questions as a broker will have access to many different types of lenders. And YES! You can get a business loan if you are a sole trader or self employed. Q: What to consider when buying a business? The first question to ask is why are they selling? You don’t want to be throwing good money after bad. A business may be for sale because it’s not making enough money or barely breaking even. We’re not saying you can’t turn it around, it may well be the case of poor management. Sometimes there’s a genuine reason for selling such as retirement, moving, health and/or family reasons. Just ensure you conduct proper due diligence. Carry out competitor research, inspect the financials, products/services and premises. Learn who the customer is are and understand the market. Q: Is it hard to get a business loan? No, the application process is quick and simple if using a fintech lender. They just want to make that you can service the loan without hurting your business - responsible lending. If you’ve been in a business a while and your making a profit it should be a simple process to get yourself a business loan to help you grow your business. It costs nothing to find out, and as the old saying goes, money makes money - so the quicker you can get access to funds the quicker you can begin making more money. Q: Can I get a loan to expand my business? Business expansion is usually a good sign of business growth and you shouldn’t be held back when growing. Funding business growth should be part of your business plan and strategy. After all, isn’t that why you’re in business instead of working for someone else? To build it, grow it and make it a successful business. When applying for a loan to expand your business the lender will look at your financials, industry and how long you have been in business and talk to you about your intentions to get a better understanding of how they can help. Q: Do you need a deposit for a business loan? No, in Australia you do not require any deposit to get a term loan for your business. You may only be required to have a deposit if you were buying a piece of equipment, or if you were wanting to buy an existing business. You’re a seasonal business and you need to build your product inventory before the holiday period even though you're short on cash right now. History tells you you will make the sales. The reality is, whatever it is that you need for your business, from working capital, releasing cash from unpaid invoices or to bring on new employees, an unsecured short term small business loan can be invested in to your business however you like. You can even get a business loan if you have bad credit. While the banks might seem like the obvious place to turn for a loan, they aren’t always a viable option for small businesses. Bank loan application processes can be slow and burdensome – and without a solid financial history or security to offer, small business loan applications frequently get rejected by banks. Small business lending by non bank lenders in Australia is on the same trajectory as the US market. 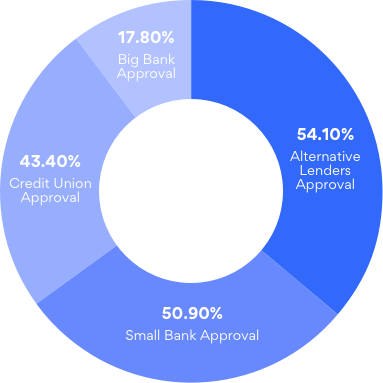 In the US the Small Business Lending Index indicates alternative non bank lenders approve around 64.1% of all applications whereas the big, risk averse banks would approve less than one fifth (17.8%) of the same commercial applications. 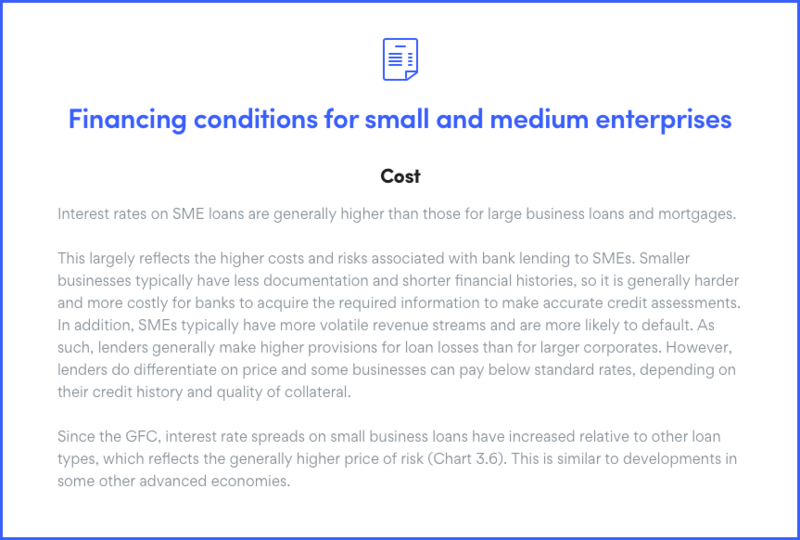 In fact, Morgan Stanley recently predicted that alternative business finance lending would lend $11.4 billion annually to SME’s by 2020 in Australia when $0 was funded via marketplace lending in 2014. The convenience and speed at which small business can finally get access to money through unsecured business loans online is helping drive small business Australia forward.